The AIM NetworkNews and PoliticsDay to Day Politics: A new way forward. The case for a Federal ICAC. Day to Day Politics: A new way forward. The case for a Federal ICAC. In February of this year Transparency International announced that Australia had slipped to 13th on the global corruption index. Transparency International measures bribery and the diversion of public funding. I suppose – at first blush – to be ranked 13 out of 180 countries isn’t a bad thing, but it’s the trend that is of concern. Well, for the public it’s not just the corruption by business that concerns them but also a perception that politicians themselves are corrupt and are ripping off the public purse and lying by omission. Trust in our politicians has dropped to an all-time low of just 13%. “The index showed Australia’s corruption score had slipped eight points over the past six years, a trend which was described as a “notable decrease”. The report said that Australia appeared to be lagging in its efforts to combat corruption. These included money laundering, protecting whistleblowers, political donations and the effectiveness of our systems in general. “The Government has simply not faced up to the need to have an independent corruption agency at a national level,” said Mr Whealy, the CEO of Transparency International. The report was released during an ongoing debate as to whether Australia needs a federal anti-corruption watchdog similar to the Independent Commission Against Corruption (ICAC) in NSW. It has to be said that Transparency International’s report has effectively backed this need and has given support to Bill Shorten’s plan, announced in January, to implement a Commission Against Corruption. The Australian public simple cannot expect good policy to start emanating from government until we begin to clean up the system. Bill Shorten has committed Labor to do so but as yet the Coalition hasn’t, and the voices in support are but a whisper. I fear that politicians who do not take this seriously may pay a big price for their ignorance. When announcing his policy at the National Press Club Shorten admitted that there were millions who were now disaffected with the political system and weren’t even bothering to vote. I, like many other readers of this site, feel that for many years now, the integrity of our politics has been gradually sold out by a bunch of corrupt politicians more intent on feathering their own nests than working for the people. We are sick to death of the travel rorts, the living away from home allowance, donation rorts and ministers when the retire, walking into senior positions with companies in the same field. But if the commission doesn’t have authority similar to a Royal Commission, independence with broad jurisdiction, with all the investigative powers it requires and is without government interference then all will be in vain. Why do we need a Federal Integrity Commission? A The AFP aren’t doing their job. The are understaffed or appear to be biased towards the government. B The government seems to be unwilling to tackle the corruption and rorts that breed within the membership of their ranks. C MSM (Mainstream Media) seem to turn an almost “blind eye” to the endless Federal corruptions and rorts. MSM rarely even gives scant attention to the “pervading corruption” that runs through Australian Federal politics. E “The economic impacts of corruption are well-known. Business costs increase, capital is not allocated efficiency and inequality worsens. The nation’s gross domestic product could have been $72.3 billion higher this year, if the perception of how much corruption is going on had stayed at the same level as in 2012, according to Transparency International’s yearly Corruption Perceptions Index. PS The last word goes to Barnaby Joyce: If you are corrupt, if you really are corrupt, you’re going to get busted. You’re going to get caught. You’re going to go to jail. We’ve seen other people who have been busted. We’ve seen Senator Sam Dastyari. That’s why I find it amazing Bill Shorten talk about it because most of the problems reside on his side. When a federal ICAC is created, give it real teeth and power much like a standing royal commission also give it the resources and powers to make it so it can conduct retrospective inquiries there are to many of these maggots that got away with to much and if it ensnares some from the left, so be it. All corruption needs to be weeded out. B. More than unwilling, they flagrantly don’t care about their low public perception, the uncorked corruption and unconcealed rorting. They appear to wallow in it, daring anyone to challenge it in their unshaken belief of public apathy and a mostly compliant MSM. Sad to say, in this they are correct. The infuriating part is that we already have laws covering most of these things – they just aren’t enforced. The OECD Working Group on Bribery previously criticised Australia’s lack of convictions in foreign bribery cases. Despite visual attempts to improve, the latest report is still critical…..
“in view of the level of exports and outward investment by Australian companies in jurisdictions and sectors at high risk for corruption, Australia must continue to increase its level of enforcement of foreign bribery and related offences against individuals and companies. So Shorten’s making noises about a National Integrity Commission (NIC). Congratulations. But the devil will be in the detail – beginning with the definition of corruption. What might seem straightforward will prove to be very difficult at any number of levels – particularly for a politician(s) who specialises in deals. Clearly politicians who simply trouser dollars in brown paper-bags, like Joh and Abbott did (for a time) present no conceptual difficulty. When it comes to campaign donations, for example, the lines begin to blur. With local government, developer donations are clearly a no no, but what about a politician who promises increased government funding for an organisation in return for an active, public endorsement? Is that corruption? There’s no direct personal benefit. Or maybe there is? If Shorten or Turnbull promises X or Y to an organisation(s) and does so in direct contradiction to recommendations made by a duly legislated, statutory authority, is that corruption? if it is, then pork-barrelling might be reduced to being an historical curiosity. (Not likely). Personally, I don’t think Shorten’s the one for that task. But perhaps he’s prepared to outsource that to a team of others. Gillian Triggs probably has time of her hands as a possible Chair. While all appointments will be politically controversial, we have to start somewhere. Look no further than the Minchin Protocol, a get out of jail for free piece of crap to let politicians get away with rorting when they are caught out. Yet even this they rort. Denying it to those they want to punish, Peter Slipper anyone, whilst using it as a shield to protect their own corrupt individuals, Tony Abbott anyone. I could, as I have in the past, say they couldn’t get any lower, but how low they go doesn’t matter an iota to them unless it directly effects their ability to corrupt and rort. So how can their depravation be made to hurt them? Certainly there is nothing in the current system, and though an independent Federal corruption body with unfettered power like a Royal Commission is a start, it will most likely only hurt the most serious offenders. With things like the Minchin protocol and other legal ways of scamming the public purse, such as using a relative’s investment property as an abode whilst in Canberra, there is more needed than a corruption watchdog. Somehow they need to be forced into making sweeping changes to their perks and lurks on top of having a corruption commission. The humorous writer, Howard Jacobson, once wrote : Isn’t all that honesty a bit boring… I forgive him, but not our Government, they lack both humour and honesty…. It is important that any Federal ICAC include politicians and their use (and abuse) of the Federal Parliamentary Allowances Scheme, plus the ability to review government decisions like those forgiving the debts of parliamentarians who are unqualified to sit in Parliament. There are severe penalties for such unconstitutional representation, but the RAbbott Dicko Morriscum Turdball misgovernment chose to ignore them … especially for the representative of the National$ in New England. I agree ME. It is the rules that need changing. Most of the things that really piss us off are within deliberately vague guidelines. As MN says, corruption is not specifically defined. Even with all the revelations that came from the NSW ICAC, only the most blatant corruption attracts any punishment. Arthur Sinodinis used the phrase “I don’t remember” or “I don’t recall” more than 50 times during his evidence, but has not been the subject of any adverse comments in the report. The Iceland PM had to leave office within a few days after the Panama Papers were leaked. Our PM did the same thing and sits pretty. Is Joyce going to be prosecuted? Re whistle blower protection : people are afraid to speak out because corporations have money and connections. They hide behind ‘commercial in confidence’ , while FoI or similar requests are often to no avail, as these require the consent of the possible perpetrators. As the existing mechanisms seem unable to detect corruption due to corrupt bias, this post certainly appears to outline evidence for a federal ICAC. Let’s not forget this form of corruption. Documents explaining a $30 million taxpayer grant to pay TV network Fox Sports for coverage of women’s and “niche” sports will not be released, Communication Minister Mitch Fifield says. Mr Fifield told ABC Radio Melbourne this morning the Federal Government’s decision to fund the sports broadcaster for the coverage followed usual practice. “There tends not to be letters flying around all round the place in the preparation of budget measures,” he said. Murdoch’s editorials are worth much – in terms of being a political donation. How to measure that? Assuming it ought to be weighed and measured. That it was rewarded to the tune of $30 million – from the public purse – is unbelievable. Will Shorten’s NIC be empowered to investigate retrospectively? If not – then why not. If so will Shorten’s promise to give Catholic Education an extra $250 million be also up for scrutiny? What about Joyce’s inland rail? Than there’s … And don’t forget … etc. What about undisclosed conflicts of interest? Are these also types of corruption? When Turnbull sits down to discuss re the legalities of multinational tax avoidance and how to outlaw same, does he, (as an effective tax resident of the Cayman Islands,) absent himself from such discussions on the conflict of interest grounds? Are these instances noted and recorded? Where? And by whom? Are they on the public record? Are they subject to FOI? Have journalists ever asked? One wonders whether Shorten will proceed? Will it be within the first 100 days? The first term? Or will it be like Rudd’s promise for needs based funding – conveniently delayed so it was never funded – except in the (promised – speculated) forward estimates. Have a look at the register of pecuniary interests and you’ll quickly see why the Coalition oppose any action to rein in family trusts. I nominate Prof. Gillian Triggs as our first President. She has proven to be above politics, especially when pursuing this cruel fascist government over child detainees. One wonders what that advice was and what steps she took to resolve the situation. Perhaps journalists might ask? Surely she would not be doing deals in Germany while travelling at our expense? Surely she would not be doing a Jared Kushner? Or is Trump now setting the new (low) bar? As I noted previously. Observed an older woman swimming in a lake (near Helsinki). Very, very cold – me wearing warmest clothes. Asked her if she swam there regularly. Yes every day – but not in winter because thick ice formed on the edges. She informed me that in winter, one had to go to the end of the jetty, away from the ice, before entering the water. Yep – they sure do things differently in Finland. You mean like these conflicts of interest? Yes KL. But people need reminding from time to time. Last time Cormann was there to do the translating but this time he might be needed back here because with a Nat acting as PM anything could happen. Could Barnaby stage a coup? Perhaps Abbott? Or maybe Bishop, the Younger?Turnbull’s numbers are not as solid as they once were. I read sometime ago about the attitude toward taxes in Finland. At the time, all personal tax records were available on-line to the public so you could see how much tax any individual paid. Where we compete for who is “the richest”, Fins compete for “who paid the most tax” and the wealthy vie for that position to show what good citizens they are as a measure of social status. Their taxes are relatively high but all citizens know they will be looked after “from the cradle to the grave”. They also tax their two main Churches. He was deputy chair and chair of Australian Water Holdings from 2008 to 2010. Chairs are are paid to know the business as well as they possibly can so that they can strategically plan- Any excuse of “not knowing” should be completely and utterly disregarded and hit with penalties such as 3 months for each “Don’t know’ that they should have know as a Chair. We’ve seen similar things occurring with the Banks RC and I recall the exact same thing with the GFC Bankers and Enron in the US. There is a legal mafia out there with corps. Honesty and integrity are two mutually exclusive words when talking about the LNP. Liars and corruption, however, suit them down to the ground. The last thing Trembles and Crony Co. Inc. wants is a federal ICAC unless it’s well and truly gutted and had all its teeth removed. I don’t place much faith in Shorten putting in place an ICAC that has full powers to investigate and, if necessary, lay charges for corrupt politicians and public servants. Both sides of federal politics, and other parties, have dirty little secrets that they want kept hidden from public view. jimhaz, re Arthur Sinodinis and donations. Arthur was (technically speaking) part of an organisation that was making the donation AND at the same time part of an organisation in receipt of same – (Honorary Treasurer, Liberal Party at the relevant time.) He managed not to see what was going and what was coming. A remarkable feat of blindness and he did it without the aid of a white cane. Yep the comings and goings of corrupt donations was never visible to Arthur. Thus he was the perfect Assistant Treasurer. He was the embodiment of the Three Wise Monkeys “see no evil, hear no evil, speak no evil”. 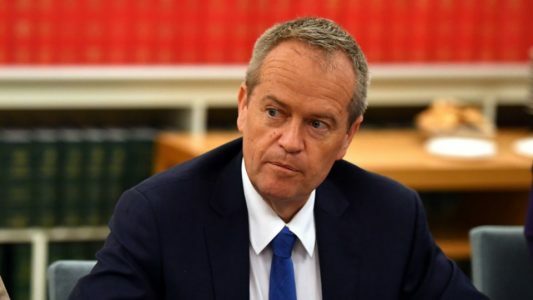 Bill Shorten announced details of Labor’s National Integrity Commission at the National Press Club in January this year, followed by a Press Release giving details. It was completely ignored by the media. The policy has been drafted up with the aid of the Australia Institute and a panel of eminent people, including judges. Would have the powers of a Royal Commission, and be able to investigate Federal politicians, public servants, contractors to Federal Government, the judiciary and even the Governor General! Libs of course luke warm. Media as I said, ignored it. I watched ABC next day and not one mention – yet the news time was filled with Trump Trivia. Insiders also ignored it. Barnaby didnt like it – said “We have the senate for that” which is the height of stupidity and irrelevance. Mark Dreyfus has it in the parliamentary system somewhere, possibly just for discussion at this stage. Thats all I know about it. The pledge was that it would be set up in their first year of office. Seems to me this is a perfect example of how the Labor Party is seriously disadvantaged in this country. The media is far too powerful. Not completely ignored by the Media. Just Google – National Integrity Commission Bill Shorten and view the results. There’s ABC News. Daily Telegraph. The Guardian. The Conversation. The Monthly. Independent Australia. SBS. Sky News. Herald Sun. The New Daily. The Australian. The Mandarin. The Financial Review. While one may argue about the level, fairness, balance and the like I can’t agree that it was completely ignored. Clearly it wasn’t. Federal politicians in aust are not subject to the same anti corruption laws as those in NSW that were used to convict Obeid etc because those offences are common law offences and the Federal Criminal Code Act expressly excludes the operation of the common law offences. The definition of ‘corruption’ at common law is very broad and can include nepotism and conflicts of interests and duties. With the pervasive engagement of negative gearing and capital gains tax laws by Federal politicians, everytime a federal politician votes on laws maintaining those tax laws or votes on tax or money bills they are technically at common law acting corruptly. THIS IS WHY THE CRIMINALS IN PARLIAMENT DO NOT WANT GENUINE ANTI CORRUPTION LAWS. “Shorten described restoring public confidence in Australia’s democractic system as “bigger than me versus Malcolm, bigger than Labor versus Liberal” and crucial to winning back trust.” Shortens position shows how thick he really is. He cannot see the system is inherently flawed and deficient and needs fixing only that trust in the system needs to be restored. This suggests he”ll just set up another toothless beauracracy that will convey the impression that politicians are accountable rather than put in place serious arrangements that will genuinely enforce anti corruption measures. If you want genuine change you wont get it from the ALP you will only be changing the dressing on a turkey. OPPOSE THE MAJOR PARTIES. ““In Australia we had some research done where it showed that about 80% of Australians believe that we should not be spending more on foreign aid or that what we spend is about right,” Fierravanti-Wells said.” I would really like to know what the “we had some research done” was apart from, most likely, asking four LNP politicians and ministers and maybe one token other. Otherwise it’s just the LNP making baseless value judgements without any setting outside their substituted reality that the rest of us aren’t allowed to join (not that we want to). But they are gouging, and attempting to collect, even more tax and more and more money from the little people. Someone has to pay for the corporations and big end of town to avoid paying tax, with the blessing of the best party money can buy.